This is the services on the A55 in Wales. For the services on the M1 near London, see London Gateway. For the services on the A16 near Spalding, see Lincs Gateway. Better known as Northop Hall services, this site offers array of different facilities spread out over a hill. 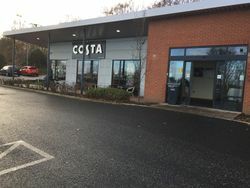 The main amenity building on the eastbound side, now only home to a Costa unit. When driving westbound, the road signs are very clear that the site is called Gateway services, referring to its position just beyond the Welsh border. The eastbound side doesn't have a name but its facilities refer to themselves as Northop Hall. On the westbound side there are a number of facilities spread out across the hill, but the Costa building claims to be the main public facility (the one meeting the contractual obligation to provide free toilets). The filling stations are operated by Shell. Both sides of the services opened in the late 1980s. It was originally planned as a pair of Little Chefs, but what opened was completely different. The westbound side had a forecourt and a hotel, with space in the middle left for more restaurants, while the eastbound side opened with a Happy Eater, a Travelodge and a forecourt. In 1996 Forte changed the Happy Eater to the more profitable Little ChefHistory brand, and it received additional attention with a thorough refurbishment providing with air conditioning, new furniture and a blue colour scheme, in order to attract more evening diners. Under Granada, a Burger King was opened, but the 'blue' changes were later undone and the Burger King itself closed. This became a Coffee Tempo! and later Little Chef Express. The restaurant was closed by Euro Garages in April 2017 and re-opened two months later as a Starbucks. A Greggs store then joined the Starbucks in late 2018. The westbound Subway and Costa opened in 2008. The Subway unit closed in 2018 and the unit is currently vacant. The eastbound forecourt was formerly a Total site. 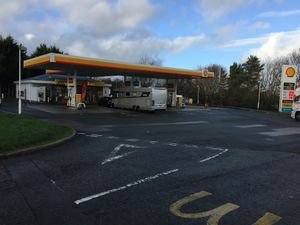 It was re-built by Shell in 2016.